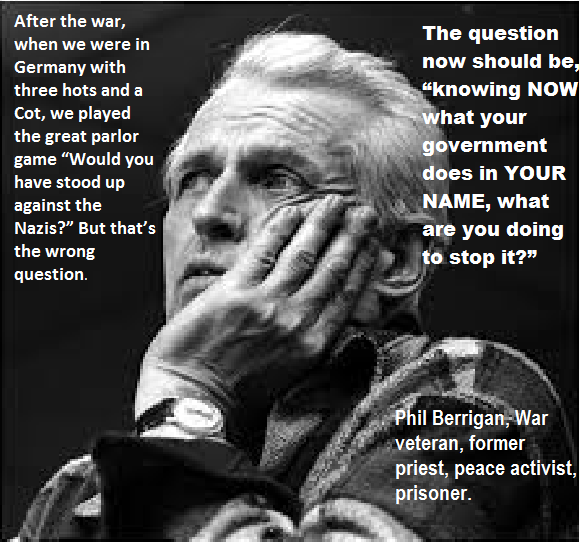 What Phil Berrigan once told a prosecutor at a Plowshares trial. One of the issues that hangs up discussions of near term human extinction (especially among those who understand that we might well be on the road for that) is the way the larger public might abandon any attempt to fix the climate if they know we’ve passed the point of no return. I’ve had conversations and correspondence on the topic with a number of climate activists including some who are credentialed scientists. What I find myself running into is resistance to the message. Not the science behind the message, but the message itself. Again and again I’ve been told “you can’t say the climate fight is lost because nobody will do anything and the climate fight WILL BE LOST”. Over the past few weeks, I’ve been getting ready to perform my play A CLOWN, A HAMMER, A BOMB, AND GOD (next Saturday at Tompkins Square Park, if you’re free). I’ve been thinking about people like Phil Berrigan, who was one of the original Plowshares Eight and who spent his whole life fighting uphill battles against war and militarism and racial injustice. And I’ve been trying to find a connection between the activists’ need to change the world versus the realists’ understanding of science and the mechanisms of climate. And I’m drawn to the work of pacifists like Berrigan and Father Carl Kabat and others, who never thought the work would be easy. Which brings me to today’s topic–a pamphlet by David McReynolds called A PHILOSOPHY OF NONVIOLENCE (this is the place to buy it if you want to support causes that matter). David McReynolds is a longtime activist and was on the board of War Resisters League for many years. In the pamphlet, he coalesces the ideas, theories and experiences of many other activists in order to explain why nonviolence is a workable strategy –indeed, the only workable strategy– to affect social change and (even) revolution. The person using nonviolence will seek to be absolutely open, honest and truthful. The person using nonviolence will seek to overcome fear, so as to act not out of weakness, but from strength. The person using nonviolence will never defame the character of the opponent, but always seek to find what the Quakers call “that of God” in those with whom we struggle. We shall do our best to love those with whom we are in conflict. How can we be honest when admitting an error may make us look foolish? All valuable, but it misses the conundrum I proposed at the beginning. If you know the truth and it’s unpleasant–it might even cost you support–you’re obligated to tell it. If that means people don’t support you, that’s the price you pay. But the marquee names in environmental protection aren’t being completely honest with you if they don’t own up to the increasing likelihood that we’re on a road to ruin and there’s no turning off. This is something that McReynolds argues about as well–sometimes there is no chance of your ‘winning’ through protest or nonviolent action. He has a whole section about ‘Nonviolence and Hitler’ that’s worth reading in this context. The standard boilerplate argument against pacifism is that ‘nonviolence couldn’t stop Hitler in (say) 1942. But this argument is specious, argues McReynolds, because we know now that NOTHING could stop Hitler in 1942. Every nation that could had arrayed against Nazi expansionism, and everyone enlisted in the cause was unleashing all the violence they could unleash. Hitler could not be stopped in 1942 absent some massive uprising in Germany itself. Stopping Hitler in 1942 by any means was impossible. That did not relieve anyone from their responsibility to try. One thing that McReynolds also notes is that many of the people who became our icons in nonviolent struggle–people like Rosa Parks and Mahatma Gandhi and Martin Luther King, JR–were not the first to try to effect change. History has lost the names of all the activists before Rosa Parks who tried and failed to crystallize the fight for equality by fighting Jim Crow bus seating in Montgomery Alabama. And Rosa Parks was not a tired housewife who’d just had enough–she had become a civil rights activist after being galvanized by the trial of the Scottsboro Boys decades earlier. But there were no guarantees for Parks that her 1955 action would be the one that changed the world. My point (and I do have one) is that we face near term human extinction. The tipping points have probably all passed us now. The horrors that are visiting our planet right now are as nothing compared with what may wait in the wings. But as Edward Abbey pointed out, action is the antidote to despair. There are actions we can take right now that will ease the suffering of people in the coming months, and actions we can take to ensure that someday the earth will come back, even though we won’t be here. To paraphrase Phil Berrigan, knowing what you know now, what are you doing to stop it? Dan Kinch..thanks for courageously and soberly setting out a framework to take in these seemingly impossible realities..no one i know wants to talk of these things, to face the finality of what has been sowed..and certainly, one has to look around for people willing to write and publish on these matters..press on..